Last night I sat in front of my computer and tried to write a blog post that I should have written a few weeks ago. I wrote for about 3 hours and when it was all said and done I probably “wrote” about 3500 words. 500 words at a time, each and every one of them eventually falling victim to the delete key. It was all crap but I kept on trying. For reasons that will become apparent, last night seemed an especially special night to write this post but I just couldn’t get it right. So instead of summarizing I’m going to use past posts and other sources to fill in the back story. That’s where I keep getting tripped up — the damn back story. If you would like to know what I’m talking about, you should probably start here. While you’re at it, please head here and poke around for a while. Don’t worry, I’ll still be here when you get back. Yep. Thanks to the wonderful people at Mission iPossible and all of the wonderful people who donated to Mission iPossible Liam is now the proud owner of an iPad! He was so excited to open it, though truth be told the excitement had more to do with the wrapping paper. Karin and I on the other hand are so beside ourselves with joy at this amazing gesture and the incredible potential it provides for Liam’s development, communication, and fun. To explain the benefits that the iPad affords Liam in his development would take days, maybe weeks. I just don’t have the words to tell you how monumental this tool really is. Babies and children learn from play, but how much play is possible if a kid can’t crawl, turn over, or even sit up? Aside from the global delay that Liam’s Miller Deiker Syndrome brings, his low muscle tone makes most toys, including the toys designed for development, near useless. Sure, we’ve got them all and they come out during playtime and therapy time but its the adults hands that affect change with those. The ipad on the other hand helps Liam learn the connection of cause and effect better than any button or switch ever could. The first app that we downloaded is called fireworks. Touch the screen — see and hear the fireworks. You should see Liam play! Next was the piano app. You’ve all seen it on the commercials. Pretty straight forward and vanilla right? Not when we hear Liam tickling those digital ivories and singing along. That’s right SINGING ALONG!! Sinatra? Buble? Andrea Bocceli? Amateur hacks compared to my boy. But it’s not all play and work though, sometimes it’s just a matter of watching cartoons on a device that can be placed anywhere and accommodate any of the positions that Liam may find himself in. His stander, his crib, his boppy. Four months ago I didn’t think I was a part of any “special needs community”. To be honest, even though I had been writing this blog for over a year and I knew about one or two other blogs that talked about kids with special needs, I didn’t even know a special needs blogging community existed. Now I know I’m a part of something bigger. Now I know that when things aren’t going right, I’ve got people to talk to. People who get it. People who’ve been there. 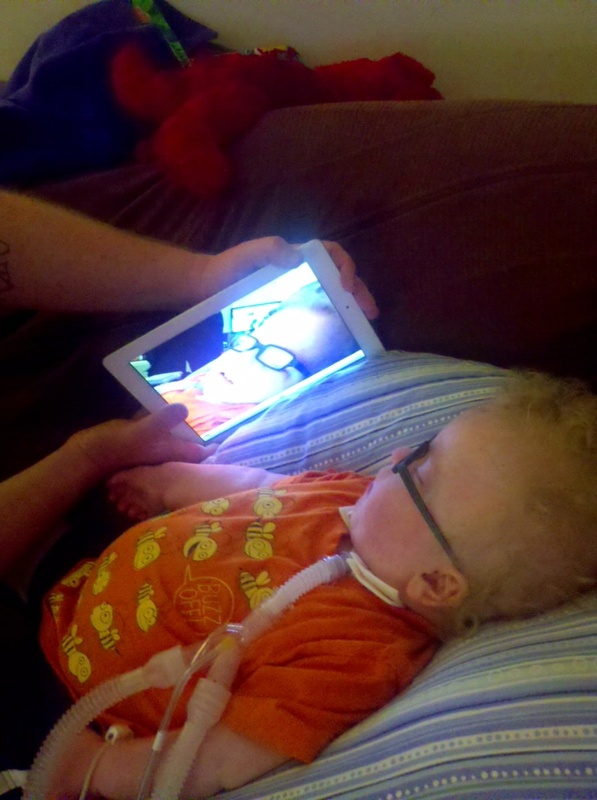 Just a few weeks after the original ipad contest mess happened, Liam got sick and was admitted to the hospital. Ken from Blogzilly and Mission iPossible let everybody know that someone needed a pick me up. On a day when Karin, Liam and I needed them, well wishes and notes of concern came to us FROM ALL ACROSS THE COUNTRY. People I had never met sent word that they were thinking of us just because they knew it would help. That’s community, and it’s a part of this iPad. After over a month in the hospital I was told that although the order of ipad shipments had been randomly selected and set since before the first device had shipped, a woman I had never met whose child was higher on the list wanted Liam to switch spots with her child and get his ipad first because of all that he had been through. That’s community and it’s a part of this ipad. And that is why this post has been so hard to write. It’s about more than just an ipad. More than just a toy or a tool. It’s about something bigger than just my family. Bigger than just my son. It’s about being a part of a community of people who look out for each other. Whether they’ve met each other or not. People who saw an injustice and a promise broken but said here, I’ll help. I’ll fulfill that promise. I can’t thank them enough, for the ipad, for the community, and for the friendship. Last night Steve Jobs, after battling pancreatic cancer for years, passed away. He was 56. His contributions to our society will be felt forever. Contributions not only to technology and computing but also to design and most importantly to communication. Although it’s been years since I’ve owned a macintosh computer that is a decision based more on finances than on preference. I learned to use computers on Macs and have spent most of my life surrounded by apple products. The ipad and it’s use with Liam obviously being the most meaningful. Thank you Mr. Jobs for all that you brought to us in your time here. When Zoey was born, we were far too busy, much like you all, to think of anything else, except keeping her alive. Let alone giving a thought to the existence of a special needs community. Then seizures hit and that community that I didn’t even know existed, became my lifeline. Over three years later, here I am, in awe of this community and often unable to articulate to others outside it, what it has meant to me, especially during some of my darkest days.Friendships I cherish and will cherish, for a lifetime. You said it all so beautifully Eric and that I, that we, were able to be part of this leg of your journey with your incredible boy, has been an honor. That second picture … wow. Nearly made me cry and was, to me, a perfect example of what this mission was all about. These children. Their faces. The world that has now been opened up to them. Thank you Steve Jobs indeed. Have to use my Facebook account to reply. In a hospital waiting room. No emergency, a planned vein thingie on Jen’s leg. Bennett will be gone for 2-3 days. That is weirder than the vein thing. Though not as weird as the death of Steve Jobs. I too was a long time Apple user, until 2006, when I could no longer afford them. What an amazing human being he was. He will be missed. These iPads though…what a legacy. Because even for those that are severely disabled, they can at least offer SOMETHING. Not everybody, and it isn’t always the clouds parting and angels singing that we may hope for…but something. Heather asked me earlier today if, based on how bad things have been for me lately, professionally, physically, finacially, emotionally, pretty much in every way possible…if I was sure that Mission iPossible was something I wanted to continue doing. I never had time to respond. Because like you said, community is THE reason why this happened, and community is THE reason why it must find a way to keep going. 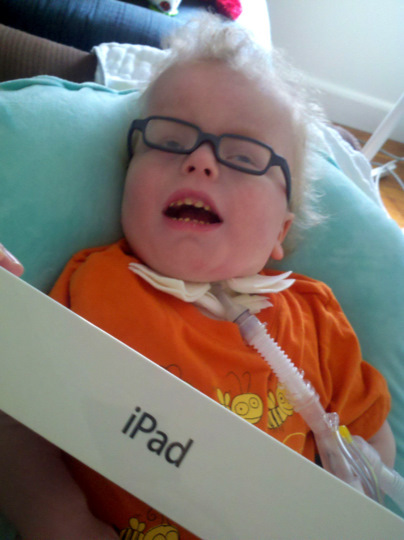 I am so happy to hear you received an IPAD for Liam! A much needed tool that every family of special needs children should have. Sounds like Liam is ready to rock out and create an album! Thinking of you all and wishing the whole family well! Can wait to here Liam Play!